30" Wide Belt x 7.5 Ft. long conveyor, 240 volt, 6000 watt heater, 250 pieces per hour. 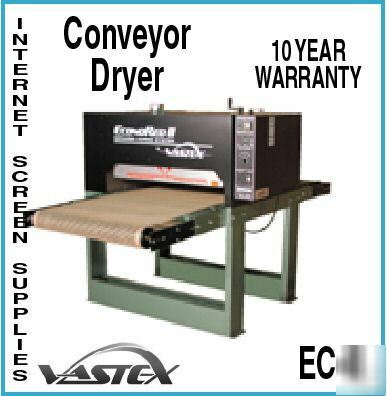 Vastex conveyor dryers are the standard of the industry. The drying capacity is remarkable in such a small compact machine. A proven design, special features, expandability and a 10 year heater warranty make Vastex dryers the best choice for all shops. Special features include heater height adjustment, expandability, power exhaust and a unique belt tracking are just a few of the details.